My neighbor has a DF likely over 20 years old which is growing on a tall Flame/Flambouyant/ Royal Poinciana tree (Delonix Regia) here on Pine Island, Lee County, SW Florida. The DF is nearing full bloom and is every bit as flowerful on the far side. It is a white fleshed variety rather plain in taste. 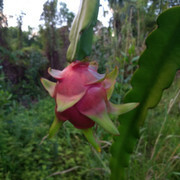 Has anyone grown sugar dragon in South Florida? I have 2 questions after spending 4 days reading this thread. 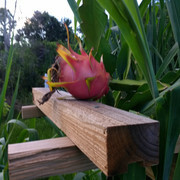 Has anyone produced a chart of Dragon fruit varieties and if they are self fertile, or need to be crossed and what with? And I spotted a seller on Ebay that has cuttings of Sugar Dragon, S8 the seller is linhthai75. The reason why i ask, is i sent a message to them about one of their listings and never received a response, though I noticed the listing had been changed to reflect some of what I asked. Some people try to root the small cutting. One person I know tried to tissue culture a small piece of stem. 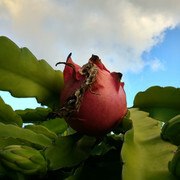 Most people I know try to graft the small piece of stem onto a rooted Dragon Fruit plant. Want to try some self pollinating varieties of DF, where is best place in South East Florida to find DF actually sold by variety or plant name versus just red or white DF??? Here’s a picture of a double dragon and triple dragon  . The Double dragon is from American Beauty and the triple dragon is from Simon’s Purple. 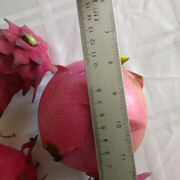 I believe the largest number I’ve grown is 6-8 Fruit on one branch of my Sugar Dragon but I have to check my old pictures to confirm. Are these ready to pick? I think it is time to take the first batch. It has been 40 days and they look ready. I will appreciate any suggestions on making the call. 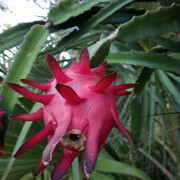 Also, if you can tell from the fruit what it is I will very much appreciate knowing. 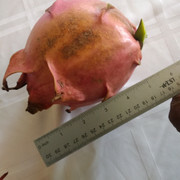 The first 2 pictures are the same fruit, it is easily 7 cm in diameter, maybe even more and has this really nice pink color to the fruit. Love the look of the red ones, what variety is it? 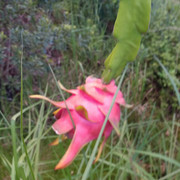 I took lots of cuttings from friends when I started down the dragon fruit road, they were unnamed. I am trying to get them identified now. 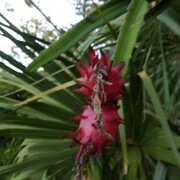 Those are ready to pick. 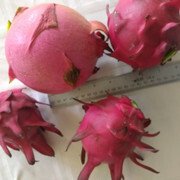 The Fruit in the fourth picture with green fins can use a few days to sweeten some more but it can be picked now if you’re not worried about maximizing sweetness. Thanks Rannman, it’s a lot of work but so far it’s a labor of love. Anyway, between collector tastings (I don't remember names of things I did not like) and trying them at nurseries (all were red) I don't think I'll waste time pursuing them. 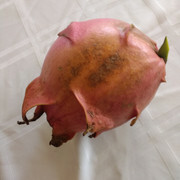 A friend has a red type (he doesn't don't know the name) and it's always sickly looking with disappearing green sections leaving behind an ugly woody core and I have on several occasions had his ripened on the plant and feel the same about the flavor. If anyone would show me one that was at the very least as sweet as a store bought tuna (which is not IMO a particularly sweet fruit) I'd likely buy one to diversify my collection of fruits. 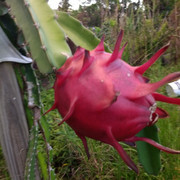 You are now a slave to your plants, enjoy! Haha Mark, I’m a slave to my day job and gardening sets me free. I’m a realist however and realize that starting an orchard now turnes what used to be my release into a dayjob. I picked 4 of them and left the ones showing a little green for later. 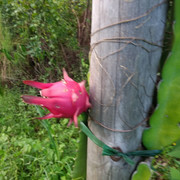 The large pink one had stayed on too long. It was sun burnt or browned on one side and had started going soft. Here are the 4 I picked. The large one was much larger than 7 cm across, more like 13 on the long side.